Do you wonder why your hair is everywhere because of no apparent reason? May be you are under stress these days that is causing your hair to fall. May be there is something else leading to hair loss. But, before you start to panic, it is important to know that it is perfectly normal to lose up to 100 strands every day. It means that losing some hair daily does not mean you are experiencing hair loss. If you are still asking, "Why is my hair falling out?" you may want to pay more attention to your diet and lifestyle to know the answer. Let's find out more about it. Every cell in your body needs protein to function properly, and the same holds true for your hair that requires protein to grow stronger. A lack of protein may cause your hair to fall out and may even lead to a change in hair color. Women should get no less than 46g of protein a day, and men need even more. Keep in mind that meat is not the only source of protein but you can get it through many other foods, including beans, spinach, nuts, and so on. Add more protein to your diet and see if it helps resolve the issue. When you are dealing with a stressful situation, it is natural to see your hair fall out quickly. While this may not make you lose chunks of hair, you may still notice your hair becoming affected. Moreover, there may be serious hair loss when you are dealing with intensely stressful situations, such as death of a loved one, life-threatening medical diagnosis, etc. The good thing is that your hair will grow back if you learn to manage stress better. Many women use all sorts of hair products to have sleek, shiny hair, but those products end up damaging their hair even more. Not only can these products damage your hair, they can also lead to hair loss. You will always be better off using natural hair products that does not contain any harmful chemicals. Your thyroid gland is responsible for regulating different body functions, including heart rate, menstrual cycle, and body temperature. Any issue with thyroid gland would affect your health, including hair. Both an underactive and an overactive thyroid can lead to hair loss. Be sure to talk to your doctor if you think you are losing hair because of a thyroid problem. If you have just given birth, it is natural to lose hair for some time. Your body has gone through some serious stress that is sure to affect your hair in many ways. Moreover, there will be a change in estrogen levels after delivery that can lead to hair loss. Just be patient and pay attention to diet to help get your hair back. 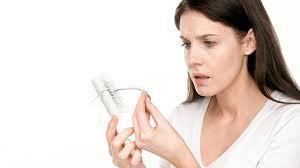 Not taking birth control pills as per your doctor's instructions can cause hair loss. Some women start, stop, and change birth control pills too often. You need to give your body some time to adjust to the types of birth control you are using. Otherwise, you will experience a hormonal imbalance that can cause all sorts of problems, including hair loss. Why is my hair falling out? It could be because you have changed your diet in order to lose weight. Many women do not understand that dieting is not about stop eating everything, but it is about eating the right stuff and saying no to harmful stuff. If you cut your diet all of a sudden, you will put your body under serious stress. Moreover, your body will not be getting enough nutrients as before and this deficiency can always lead to hair loss. If you have started losing hair after taking a new medication, you should go talk to your doctor immediately. Many types of prescription medications can cause hair loss. It is usually true in case of blood pressure medications, anticonvulsants, and SSRIs. Sometimes, OTC heartburn medications can also cause the same side effect. You may have a condition called lupus that can cause hair loss. You develop this condition when your body's immune system mistakenly attacks healthy tissues. You may have iron deficiency anemia that can cause hair loss. You develop this condition when there is no enough iron in your diet. You may experience hair loss when you have polycystic ovarian syndrome, a condition in which your ovaries produce an excess amount of male hormones. You may lose hair when you have an unhealthy scalp. This can cause inflammation and makes it difficult for your hair to grow. This can happen in conditions such as psoriasis, dandruff, and fungal infections. You may lose hair quickly when you have alopecia areta, an autoimmune disease in which your immune system attacks your hair follicles. Why is my hair falling out? Finding answer to this question is important because it will help determine the best treatment option. If you are losing hair because of stress, try relaxation exercises and learn to manage stress better. If you are losing hair because of an underactive or overactive thyroid, you can treat the underlying problem to prevent hair loss. When other things do not work, you may also consider going for hair transplant surgery. Wearing hairpieces, like wigs may also help you deal with the issue.